One of the most famous Greek myths, balancing between reality and fiction is the Trojan War; infamous all over the world due to Homer’s Iliad and Odyssey, Trojan War still stirs people’s fantasy and artist’s creative imagination. The myth of the Trojan War originates from a quarrel between three Goddesses: Athena, Aphrodite and Hera. They were arguing on who is the most beautiful among them. Eris, the deity of strife gave them a golden apple bearing the phrase “to the fairest”. She sent them to Paris, prince of Troy known for his beauty, to choose who the fairest is. Paris chose Aphrodite, and the myth says that Aphrodite promised to Paris that the most beautiful woman of the world would fall for him. The most beautiful woman on earth at that time was Helen, wife of Menelaos of Sparta, brother of Agamemnon. Helen, who stayed in history as Helen of Troy, met Paris who came with a delegation to Sparta, fell in love with him and followed him to Troy, regardless of his husband and the consequences to come. Greeks were infuriated by the “abduction” of gorgeous Helen and decided to invade Troy. Since the issue was Pan-Hellenic, Menelaos and Agamemnon gathered all major Generals from all State-Countries in Greece in order to take revenge for Paris’ insult. Achilles, Odysseus, Ajax and many more generals brought their armies and Greeks sailed for Troy. The Trojan War lasted for 10 years, as the city of Troy was enduring the siege. Many heroes died and Homer describes the battles and deaths of the heroes in the most graphic and thrilling way. After the death of many heroes, like Achilles, Hector and more, the War seemed to be heading to a dead end; there was no victory, too many losses and both armies were too tired. 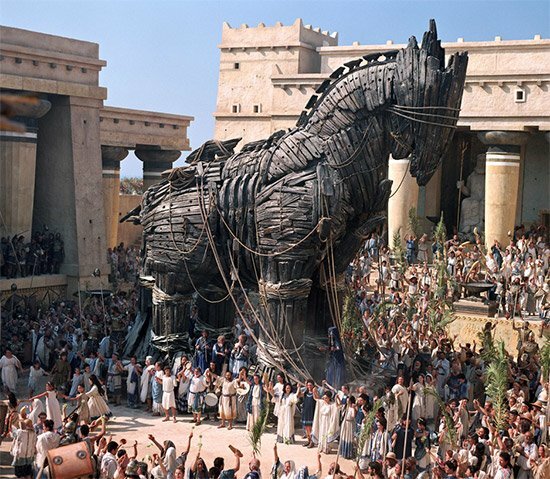 Then, the ingenious and resourceful mind of Odysseus (Ulysses in Latin) gave the solution: Greeks constructed the Trojan Horse, a huge wooden horse that they offered to the city of Troy. They removed their boats, as if they had left the area, and left the horse to the Trojans, who were happy to see the Greeks gone and didn’t think wisely. They allowed the horse in the city and started celebrating for their victory. During night though, when everyone was drunk and tired, Greeks came out from the horse and slaughtered Trojans, desecrated the temples and stole the gold and gifts from this rich city. Of course these acts were enough to earn the wrath of the Gods, thus few Greeks managed to come back to Greece without problems. Homer in his Iliad describes all the events of the ninth year of the war and refers to past events in a retrospective way with flash backs. The Iliad ends with the death of Hector from Achilles and all the other events are described in Odyssey, the epic of the return of Odysseus home. The Greeks believed that the myth of the Trojan war was real, an historic event that took place somewhere between the 13th and 12th century BC. Troy was – and is – located in modern Turkey. However, we cannot believe that Helen of Troy was the reason for the actual war. Helen, although a real person, gave the ground for an ideal myth that would excuse the imperialistic attack of Greeks to Troy, a place known for its richness and power at the time. We are not sure what the historical reality is, because the amazing descriptions and tales of Homer cannot be considered a reliable historical source. In any case, though, both epics are amazing readings and gave us fascinating stories about heroes, Gods, battles and stunning places. The Greeks have given the world great stories of men’s bravery and women’s beauty.They have given us philosophers like Socrates, Plato, Aristotle and Hippocrates (father of medicine). Olympics is the most known thing which the Greeks have given us.